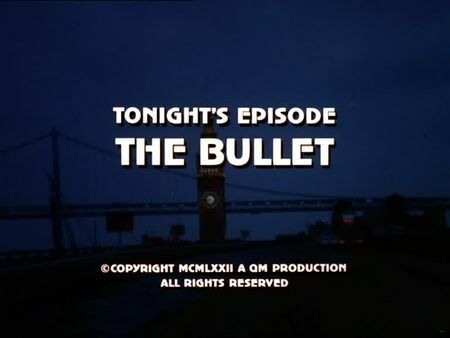 I have just added the screencaps for The Bullet to the episodes' page. When Jeff Williams, a college teacher, is paying off a blackmailer – who acutally is a former police officer specialised in blackmailing former cons who have become well-off – he is accidentally hit by a bullet in his shoulder while hiding behind the kitchen door whereas the blackmailer is killed. He can make it out of the house just before the hit-man discovers his trail of blood, however, the blackmailer’s calendar reveals his name – among one other - so the killer is on his chase to eliminate the witness and recover the incriminating bullet from his shoulder. Stone and Keller are on the trail of the assassin already but need to have that bullet analysed, however, Williams does not agree to the surgical intervention due to his background and fear of the social prejudices. Mike and Steve are somehow impressed by Williams’ dedication for his teaching activity and his students, but even when the other man whose name was listed in the calendar is found murdered, Williams would not agree to have the bullet removed until the killer abducts his wife. In this episode, Stone is stepping into Williams’ shoes to free his wife and detain the hit-man at the same time. Following a chase in the dark, the police can finally take the killer by surprise and save the lifes of Stone and Mrs. Williams. There is also an amusing factor throughout the episode as Mike’s complete incomprehension for William’s behaviour amuses Steve in a certain way. In the end, however, even Mike is appreciative of William’s decisions, and the epilogue has a good laugh too. This episode takes us to the University of San Francisco campus, including nearby Petrini's Plaza, to the famous Motel Capri on Greenwich Street, to Mount Davidson for a short scene, and to a residential neighbourhood located in Daly City. The epilogue, when Steve is buying Mike a book on lyric poetry, was filmed on the western part of Union Street.